Author Ernest Hemingway, a citizen of the world, is still one of the most studied authors in the U.S. and very much alive in the Cuban experience – his love for Cuba was reciprocated in his lifetime and continues today as an upcoming mid-June 2015 Hemingway Colloquium* in Havana demonstrates. The people read him and talk about him fondly; perhaps his personality especially striking a chord in Latin American macho sensibilities. Hemingway resided in Cuba for nearly 20 years and on Cuban television, the day he was notified he was awarded the Nobel Prize for Literature, he described himself as a Cuban “sato,” slang for mixed breed dog. 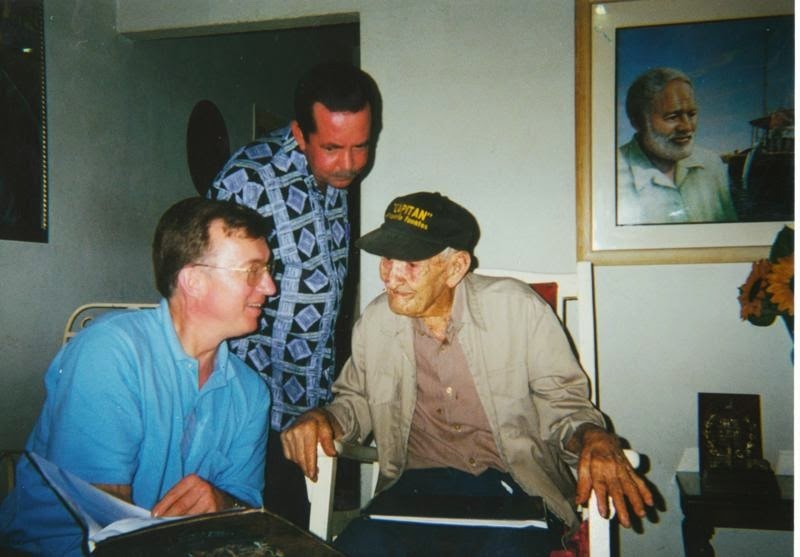 I’ve had the pleasure of observing this love for Hemingway in Cuba over the past 16 years while leading numerous cultural, medical, legal, religious, athletic and student groups to Cuba. During these years, I have developed relationships with many Cubans in all walks of life. Although Hemingway has flowed a bit up and down in the waves of U.S. criticism, he invariably rides a steady if not ascending trajectory as a person and artist among Cubans. As travel to Cuba for U.S. citizens gradually opens up, the link between the Nobel Prize winning author (born in Oak Park, IL) and Cuba will likely become more pronounced. For Hemingway in particular, this approach falls in line with how many people view him as a writer and cultural figure who explored and shaped his cultural time as a magazine correspondent, bestselling author of popular short stories and novels, Hollywood styled celebrity, world traveler, big game hunter and fisherman, and life experience connoisseur. He wrote intimately about topics with an insider’s knowledge of the “true gen,” as Hemingway termed genuine knowledge based on personal experience, research and a dominant presence. Hemingway knew the good stuff and the good spots. Although his name is sometimes shamelessly used in promoting local businesses in Cuba, most of which he actually frequented; it can often lead to an enriched experience. Hemingway journeyed out of Key West, Florida, to the Gulf Stream, the Great Blue River, in search of big fish. He rested in the ports along Cuba’s northern coast and got to know Havana. Once he started lodging there he found it to be a writer’s retreat. He was staying at several hotels, most notably the Hotel Ambos Mundos, in Old Havana just off the historic Plaza de Armas, where the city was founded. The front door opens on the corner of Calle Mercaderes, the merchant’s street leading to the grand Plaza Vieja, the commercial center of early Havana, and Calle Obispo the energetic walking thoroughfare flowing into Parque Central with its monumental structures. The Hotel Ambos Mundos has maintained its early charm , open elevator, and all night bar with grand piano and a streaming flow of world visitors there to tour the Hemingway Room Museum, view the many photos, and enjoy the old city view from its rooftop bar and restaurant. Walk the vibrant Obispo Street and you end up at El Floridita, one of the famous bars of the world, the cradle of the Daiquiri and again the place where world visitors stop for the Hemingway ambiance. Once Hemingway’s favorite bar corner was roped off but now it invites a traveler to have a photo taken next to the smiling bronze statue of Ernesto standing. Other old and atmospheric watering holes tied to Hemingway include “Dos Hermanos,” on the harbor just off Plaza de San Francisco, the “Bodeguito del Medio” off Plaza de Catedral, and the newly rebuilt “Sloppy Joe’s” near the Hotel Sevilla and the tree-lined Prado (Paseo de Marti). The Bodeguita del Medio actively advertises a Hemingway affiliation with the promotional words “My mojito in La Bodequita, My daiquiri in El Floridita” purportedly penned and signed by Ernest himself. 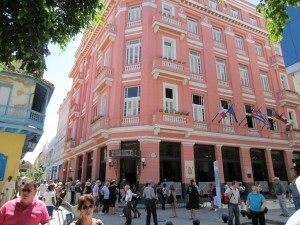 Although there is no real evidence Hemingway visited La Bodeguita or even drank Mojito cocktails, the uniqueness of this former grocery story and the longevity of the promoted affiliation has made it one of those sites all visitors from around the world want to experience. To get the “true gen” on Hemingway, you travel 15 kilometers southeast of Havana to San Francisco de Paula where Hemingway’s home Finca Vigia (Lookout Farm) is sheltered by lush gardens and walls. Built in 1887 and purchased by Hemingway and third wife Martha Gelhorn in 1939, the house is virtually as he left it at the time the U.S. embargo began complete with his 9,000 book library and record collection, big game hunting trophies, artwork, clothing and personal possessions, swimming pool, writing tower, guest house and his restored fishing boat the Pilar. Hemingway is alive here and even moreso for a group of university students that I led five years ago who were surprised to take some of the first photos of his car, recently purchased from a neighbor, and currently being restored for showing on the property. Finca Vigia also represents one of the few areas where the U.S. and Cuban governments have worked together during the strained relations of George Bush’s second term, to structurally restore the house and preserve and then digitalize the many letters and documents left there for use in academic research. At the Finca Vigia ceremony where this agreement was signed, we heard Fidel Castro expound for a half hour on the positive influence Hemingway had for him and Cuba. Travel the few kilometers from Finca Vigia to Cojimar, the fishing village where he docked the Pilar, the home of his faithful boat captain Gregorio Fuentes and the setting for his Pulitzer Prize winning novel, The Old Man and the Sea. In the early years of the 21stcentury, we could still visit Captain Fuentes at his Cojimar home in good spirits at age 100. Later, a group of young university students were bubbling at having met Gregorio’s granddaughter and hearing her stories first hand. La Terraza is the café/bar/restaurant in Cojimar is where fisherman in days past brought their daily catch. It was one of Hemingway’s favorite restaurants and featured in the Spencer Tracy film version of The Old Man and the Sea, where Hemingway appears on the patio in one of the last scenes. Nearby, the Pilar was docked in the Cojimar waters, under the shadow of a small Spanish fort. After Hemingway’s death, local fisherman donated bronze propellers/cleats to be used for a bust of their friend Hemingway set near the spot where the Pilar would sit in harbor. From this harbor, Hemingway would power his boat along the coastline and its many islands and bays fishing, swimming and during World War II, searching for active Nazi submarines. During his time in Cuba, Hemingway became a part of its landscape. As both a product of and a shaper within a developing mass media culture, his influential legacy in literature, writing style, publishing, the arts and the enjoyment of life has extended to an international brand name and image for quality products and adventurous living. The study of Hemingway as author and fascinating cultural icon continues unabated, as shown in the conferences noted below, and is continually being refreshed by new scholars, many of them women, and their expanding insights. Both Hemingway the author and Hemingway’s Cuba are benefitting. An Ernest Hemingway Colloquium in Cuba is held biennially in odd years and sponsored by the Ernest Hemingway Museum Finca Vigia. This year’s 15th Colloquium, 18-21 JUNE 2015 will feature paper presentations from international scholars and serious students of Hemingway including many from the United States. Cuba was home to Hemingway in most of his final 20 years of his life. The opposite bookend is Oak Park, IL, where Ernest was born and lived for most of his first 20 years. Fittingly, the prestigious Ernest Hemingway Foundation and Society is holding its biennial 17th International Hemingway Conference in Oak Park, 17-22 July 2016 in conjunction with the Ernest Hemingway Foundation of Oak Park.